A securities firm's electronic stock indicator reflects pedestrians passing by in Tokyo, June 20, 2016. Global markets jumped Monday as polls suggest British voters on Thursday will choose to remain in the European Union. Currency traders are dubbing it the "remain bounce," buying Britain’s pound after torrid sales of sterling last week when markets feared the European Union’s most reluctant member would head for the exit door. As British voters prepare for Thursday’s Brexit referendum on whether to leave the 28-member union, European stock markets have been enjoying a parallel upswing. Trading volumes were up by 60 percent Monday, adding more than $68 billion to the value of Britain’s biggest companies and making up for the dramatic flight from British stocks last week. The frenetic activity was triggered by a series of weekend opinion polls suggesting the Remain in the EU camp may have snatched back the lead – if only by a percentage point or two – from Leave the EU campaigners. On Tuesday, Britain’s currency and stock traders paused, holding their positions as they tried to work out whether they had gone overboard Monday. Most Asian markets extended Monday’s global rally on easing Brexit concerns. In Japan, the benchmark Nikkei 225 closed 1.28 percent higher. "The markets have a myopic focus on one thing: the U.K. referendum vote," Chris Weston, an IG Markets strategist in Melbourne, wrote in an analysis Monday. Gamblers have been getting in on the act, with feverish betting on Britons choosing to stay in the European Union. Odds on voting to remain have shortened. Bankers, currency traders, investors and gamblers have a lot riding on Brexit. Last week, Skybet was giving near even odds that Britain would leave, and 72 percent of betting was on a Brexit. Now most bookmakers are giving 3-to-1 odds against leaving. According to oddsmakers at the British betting company Ladbrokes PLC, the shift in direction has been significant, with 95 percent of Monday’s betting that the country would remain in the EU. Millions of pounds are riding on the result; bookmakers say the EU referendum is the biggest political money-spinner for them ever. Britain’s bookmakers stand to lose big if the country votes to leave the EU. But their stakes are small compared with what’s happening in stock, future and currency markets. 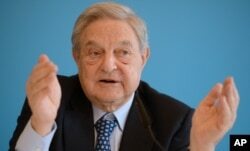 FILE - Investor George Soros warns that a British vote to leave the European Union would have grave financial consequences. The whole country’s economy is being bet on, according to investor and philanthropist George Soros, who broke the Bank of England in September 1992 by betting his hedge fund on a sterling devaluation. On Monday, Soros warned that a Brexit would "touch every household: the value of the pound would decline precipitously. It would also have an immediate and dramatic impact on financial markets, investment, prices and jobs," he wrote in Britain’s Guardian newspaper, warning of a "black Friday" for the UK. He predicted a pullout from the European Union would drive the pound down 25 to 30 percent below its pre-referendum trading range of $1.50 to $1.60. For many investors, Brexit buying and selling is motivated less by a wish to make a quick buck and more about not losing money and value. They are looking for safety, which a few weeks ago seemed to be in the dollar or gold. In holding their positions Tuesday, British stock traders possibly were heeding the advice of top market strategists. Mohamed El-Erian, chief economic adviser for German-based insurance and asset management firm Allianz, on late Monday cautioned that it might be better to be in cash during the financially turbulent environment than fully invested in stocks, bonds and other assets. El-Erian, in a roundtable briefing, said cash gives investors resilience and agility, allowing them to quickly react to new data and change course. A wag might argue that with some cash around, the average person might even like to make a wager, or, as the Brits would put it, "fancy a flutter" with bookmakers.